Félix Bracquemond (1833–1914), Landscape (after 1885), colour lithograph, 47.6 x 62.9 cm, The Metropolitan Museum of Art, New York, NY. Photo courtesy of The Metropolitan Museum of Art, The Elisha Whittelsey Collection, The Elisha Whittelsey Fund, 1960, at www.metmuseum.org. The next three artists who showed their works at the First Impressionist Exhibition in 1874 again show interesting contrasts. Born in Paris, he initially trained as a lithographer, but then went to work for Guichard, who had been a pupil of Ingres. A portrait of his was accepted for the Salon in 1852. After that youthful success, he concentrated on engraving and etching, rather than painting, and was part of the nineteenth century revival of print-making in France. He later went to work in the Sèvres porcelain factory, before working for Haviland, the manufacturer of Limoges porcelain, in 1870. He was a long-standing friend of Manet and Whistler, as well as Millet, Corot, Rodin, Degas and the Impressionists. He was one of those who helped Monet return to painting after his severe illness in Algiers in 1862. He exhibited his etchings in the famous Salon des Refusés in 1863. He had become an early enthusiast for Japonisme, allegedly having found a small volume of Hokusai prints which were used to pack Japanese porcelain back in 1856; for some time he apparently walked around with this book, showing everyone the prints. He was awarded the Legion of Honour in 1889. 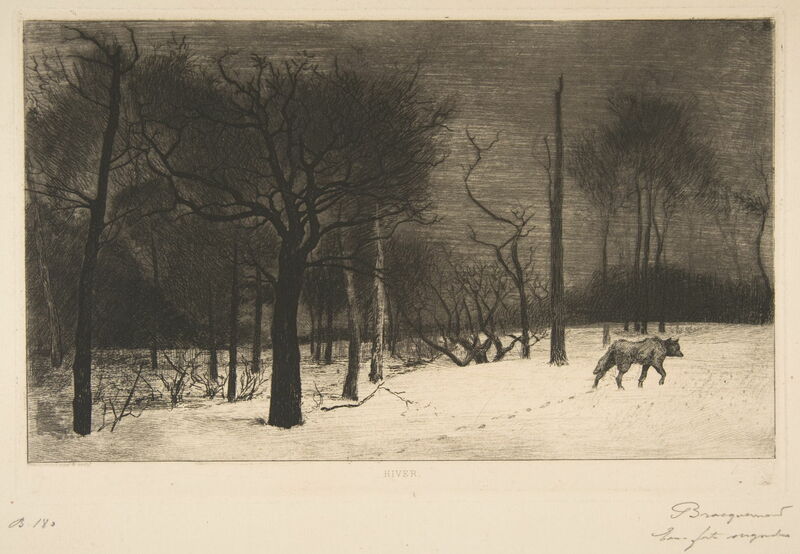 Félix Bracquemond (1833–1914), Winter (or Wolf in the Snow) (1864), etching (fourth state of four), 32.5 x 50.5 cm, plate 21.5 x 33 cm, The Metropolitan Museum of Art, New York, NY. Photo courtesy of The Metropolitan Museum of Art, The Elisha Whittelsey Collection, The Elisha Whittelsey Fund, 1960, at http://www.metmuseum.org. His etching Winter (or Wolf in the Snow) (1864) shows his early skills with a chiaroscuro landscape. Félix Bracquemond (1833–1914), Fisherman with a Net (1868), etching (third state of three), 21.2 x 30.5 cm, plate 16 x 24.8 cm, The Metropolitan Museum of Art, New York, NY. Photo courtesy of The Metropolitan Museum of Art, Rogers Fund, 1920, at http://www.metmuseum.org. 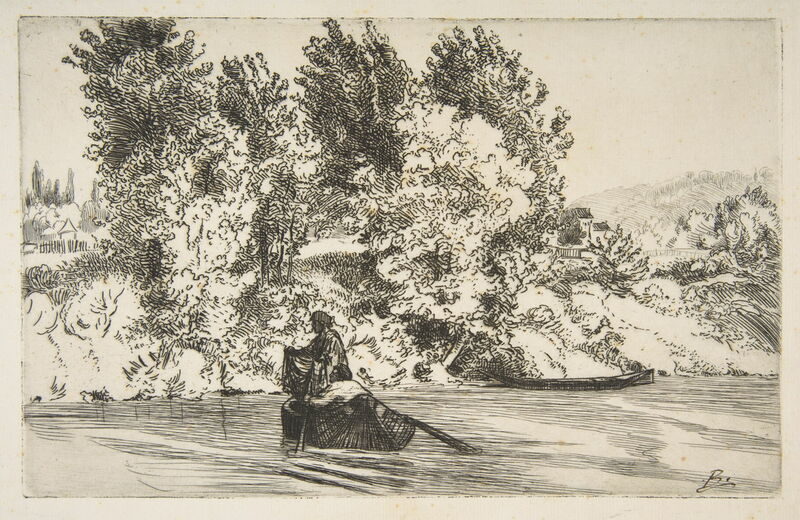 The more traditional etching Fisherman with a Net (1868) was perhaps more typical of much of his print-making. 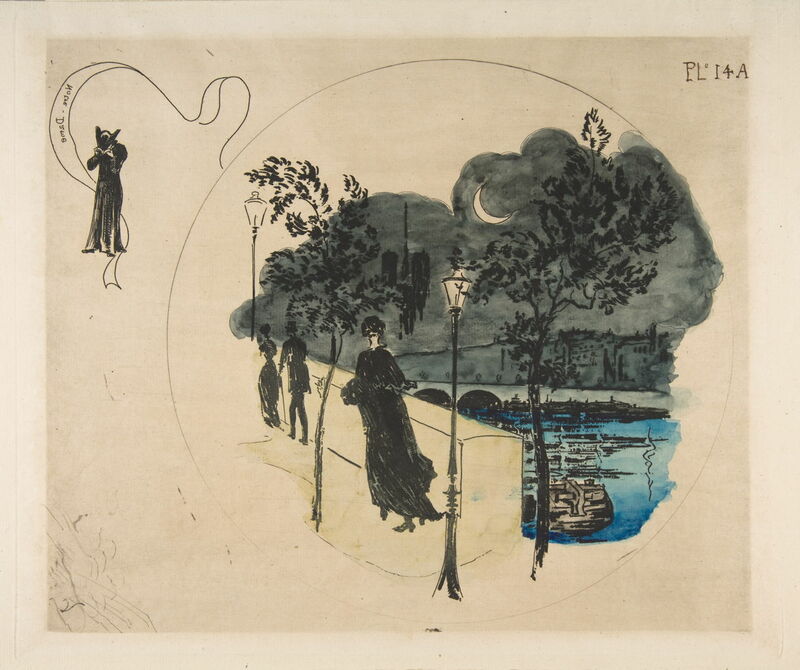 Félix Bracquemond (1833–1914), Nôtre Dame, Paris (1870), etching and watercolor on laid paper, 30.6 x 47.6 cm, plate 29.4 x 34.8 cm, The Metropolitan Museum of Art, New York, NY. Photo courtesy of The Metropolitan Museum of Art, Rogers Fund, 1920, at http://www.metmuseum.org. Nôtre Dame, Paris (1870) is another etching with added watercolor in a style more anticipatory of Art Nouveau, perhaps. Bracquemond also created many prints after famous or popular paintings. 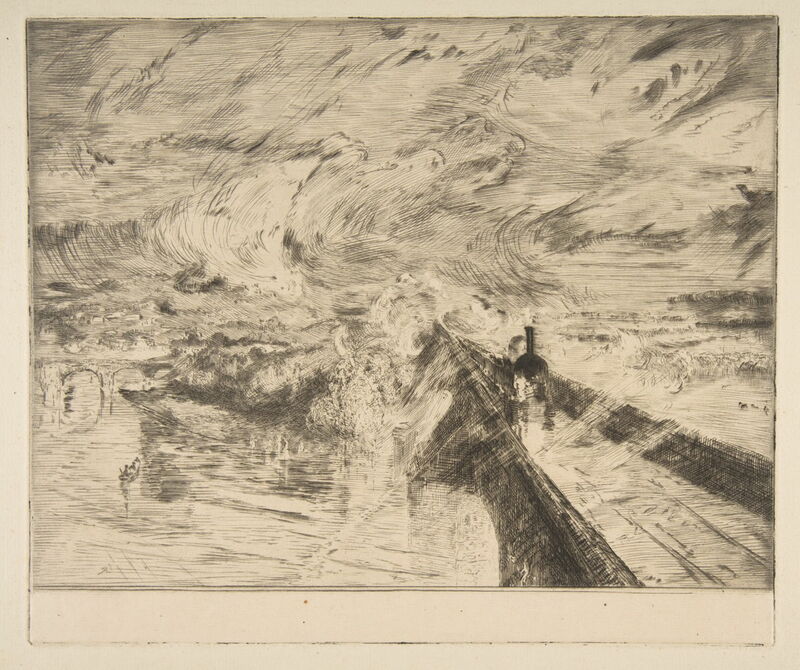 The Locomotive (1873) may well have been shown at the First Impressionist Exhibition, and is made after JMW Turner’s renowned Rain, Steam and Speed (1844). Félix Bracquemond (1833–1914), The Terrace of the Villa Brancas (1876), etching (first state of eight), 34.4 x 49.5 cm, plate 26.3 x 36.3 cm, The Metropolitan Museum of Art, New York, NY. Photo courtesy of The Metropolitan Museum of Art, Gift of David Keppel, 1922, at http://www.metmuseum.org. 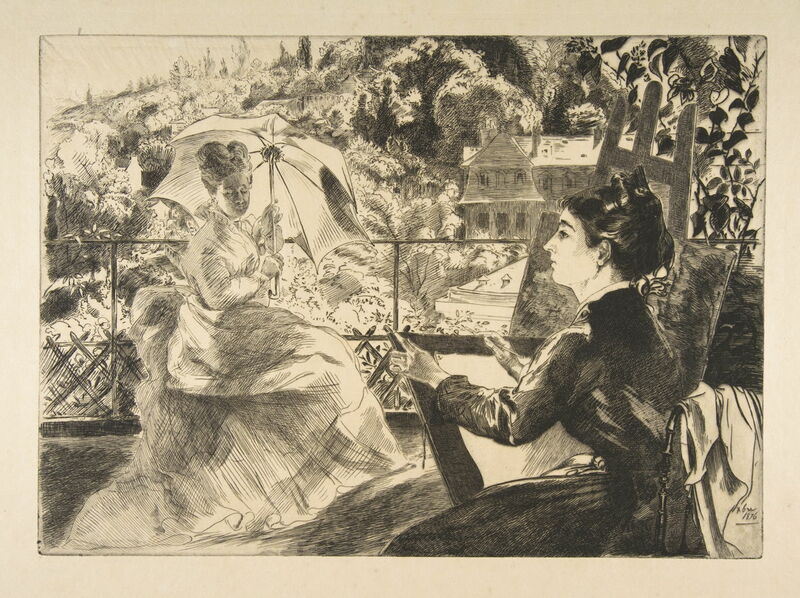 The Terrace of the Villa Brancas (1876) is another fine but traditional etching. 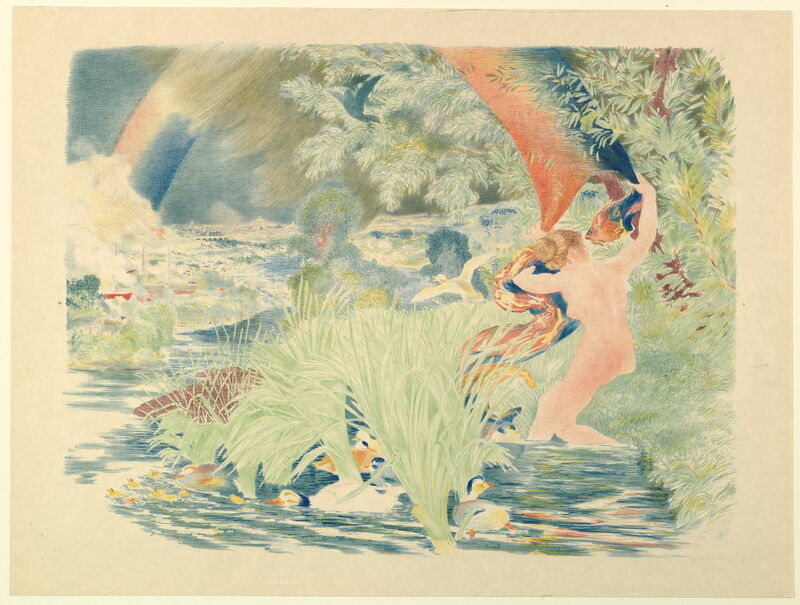 Landscape (after 1885) is an unusual and exquisitely beautiful colour lithograph made later in his career. Although hardly Impressionist, its style is more closely related to the many designs which he made for paintings on porcelain. 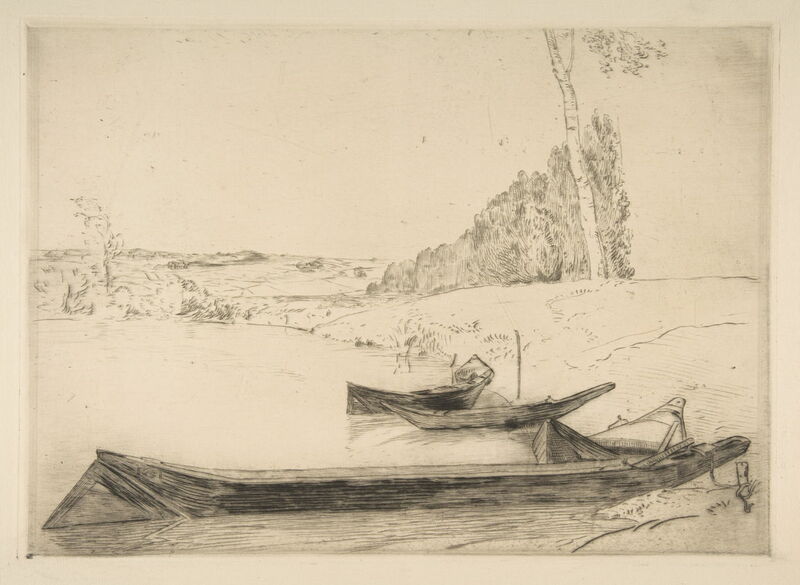 Félix Bracquemond (1833–1914), Wherries on the Bank of the Seine (date not known), drypoint on laid paper, 31 x 42.1 cm, plate 26 x 36 cm, The Metropolitan Museum of Art, New York, NY. Photo courtesy of The Metropolitan Museum of Art, Gift of David Keppel, 1922, at http://www.metmuseum.org. Wherries on the Bank of the Seine, made in drypoint, is undated but was probably printed during the earlier part of his career. Bracquemond married Marie Quivoron (1841–1916) in 1869; although he was supportive of her painting, he disliked her choice of mentors, Monet and Degas, and repeatedly attacked her Impressionist work. This is deeply puzzling in view of his prolonged friendships with Impressionists, and the couple’s social involvement with them. 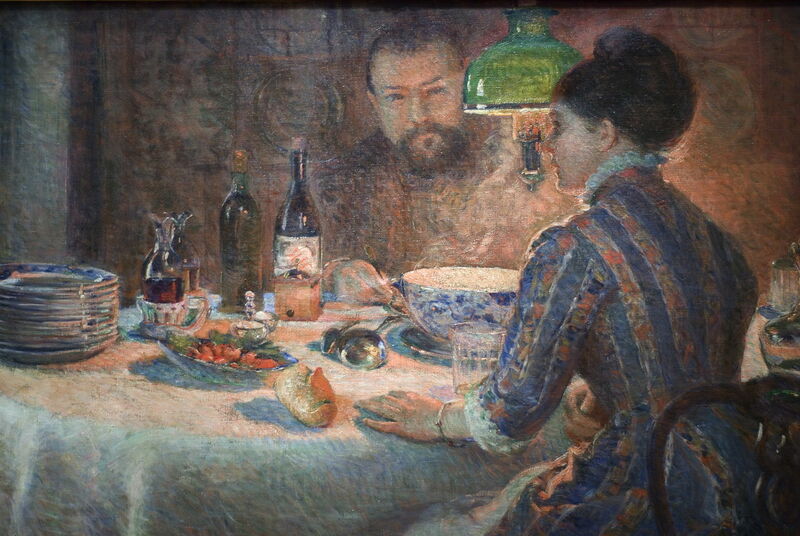 Under the Lamp, for example, painted by Marie Bracquemond in 1887, shows Sisley and his wife dining in the Braquemonds’ house at Sèvres, and is an outstanding Impressionist oil painting. Marie Bracquemond exhibited in the fourth Impressionist Exhibition of 1878, and the fifth in 1880, but finally abandoned painting after about 1890 as a result of her husband’s sustained attacks on her work. Very little indeed seems to be known about Édouard Brandon, other than the fact that he studied at the École des Beaux-arts in Paris under Corot, and remained a professional painter. He is also known to have formed – with Édouard Moyse and Alphonse Lévy – the trio of significant Jewish painters in France. Jacob-Emile-Edouard Brandon (1831-1897), Portuguese Synagogue at Amsterdam 22 July 1866 (1867), oil on canvas, 75.5 x 174.3 cm, Walters Art Museum, Baltimore, MD. Courtesy of Walters Art Museum, via Wikimedia Commons. Portuguese Synagogue at Amsterdam 22 July 1866 (1867) (I can only find this single monochrome image, I am afraid) appears typical of his work. He was awarded a medal at the Salon of 1867 for this painting. At the time, this was probably Europe’s most famous and picturesque synagogue. The sermon was being delivered by the distinguished Talmudist David de Jahacob Lopez Cardozo (1808-1890), who was appointed ab bet din there in 1839. Even less is known about the tragically brief life of this Impressionist landscape painter. He apparently had paintings accepted for the Salon in 1865 and 1876. Among his works were several notable nocturnes. With Renoir and Sisley, he was appointed a liquidator of the first Impressionist company, which organised the First Impressionist Exhibition. He also took part in the second, in 1876, but died shortly afterwards. 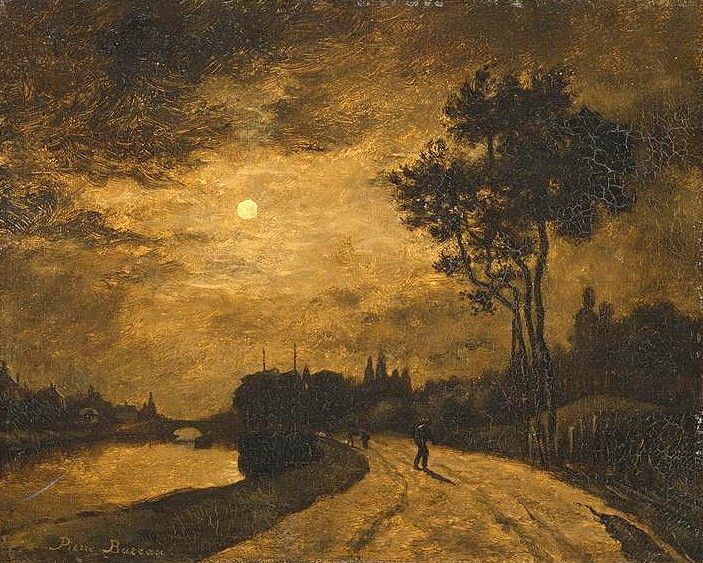 Pierre-Isidore Bureau (1827-1876), Moonlight on the Banks of the Oise (1867), oil on canvas, 33 x 41 cm, Musée Louis Senlecq à L’Isle Adam or Musée d’Orsay, Paris. Moonlight on the Banks of the Oise (1867) is one of his nocturnes which did survive, and was one of his paintings shown in the First Impressionist Exhibition. Pierre-Isidore Bureau (1827-1876), Dieppe Beach (date not known), oil on canvas, other details not known. 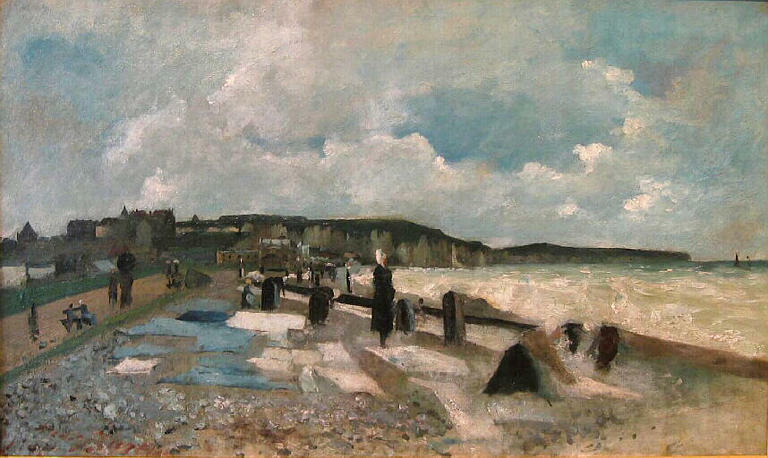 His Dieppe Beach (date not known) is a delightful Impressionist rendering of a beach off-season, with a sky which even Boudin would be proud of. 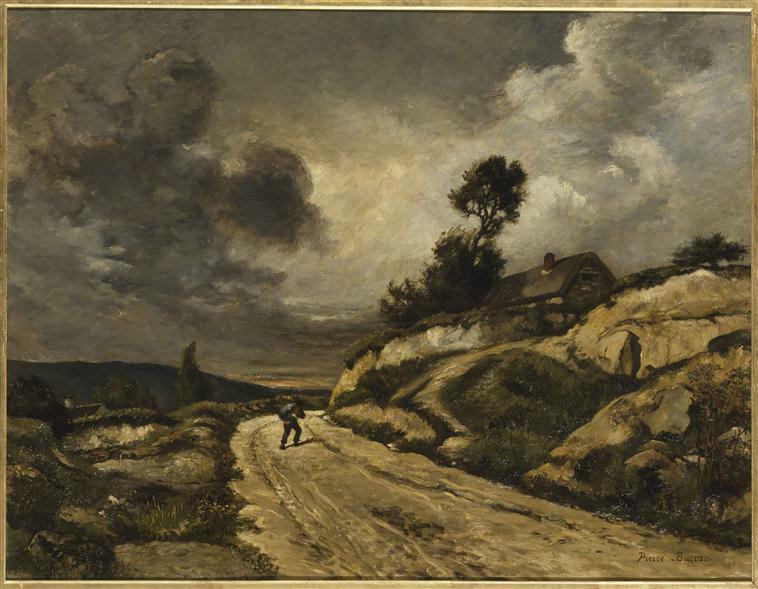 Pierre-Isidore Bureau (1827-1876), The Road (date not known), oil on canvas, 89 x 116 cm, Musée Louis Senlecq, L’Isle-Adam. Photo © RMN-Grand Palais (musée d’Orsay) / Hervé Lewandowski. The Road (date not known) also has a vivid sky, although its landscape is perhaps older in style. Pierre-Isidore Bureau (1827-1876), A Muslim lady reclining in her harem by a smoking hooka, after E. Prisse (c 1870), lithograph with tint plate, with watercolour, 25.1 x 34.6 cm, Wellcome Library no. 25657i. Courtesy of the Wellcome Library. 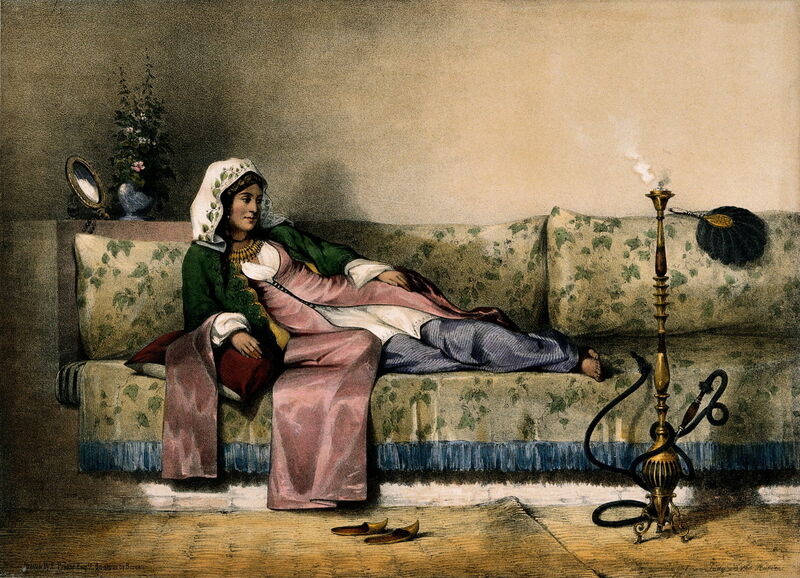 Bureau also seems to have made some prints: A Muslim lady reclining in her harem by a smoking hooka (c 1870), is a lithograph with tint plate, with added watercolour, after an original by E Prisse d’Avennes (1807-1879). Posted in General, Painting and tagged Bracquemond, Brandon, Bureau, exhibition, Impressionism, painting, porcelain, prints, Sèvres, unknown, vanished. Bookmark the permalink. How secure are your secure connections?